Dr. Victoria Laor received a Bachelor of Biologic Sciences, followed by a Doctorate in Dental Surgery from the University of Illinois Chicago. She then went on to complete a four year residency in Oral and Maxillofacial surgery at the Christiana Care Health System in Delaware, serving as the chief resident in her fourth year. She moved to New York City in 2009. 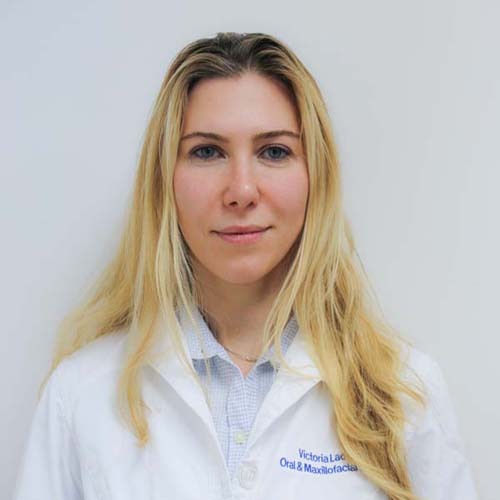 Currently, Dr. Laor is an Adjunct Clinical Instructor at NYU/Lutheran Hospital Medical Center in Brooklyn, and a Volunteer Attending at Montefiore Medical Center in the Bronx, where she performs extensive surgical procedures on patients who have experienced traumatic maxillofacial injuries and have severe infections. Dr. Laor is a Diplomat of the American Board of Oral and Maxillofacial Surgery. Board certification denotes someone who has made significant achievements beyond the mandatory educational requirements of the specialty. She is also a member of the American Association of Oral and Maxillofacial Surgeons as well as the New York State Society of Oral and Maxillofacial Surgeons. Additionally, she holds a New York State Dental General Anesthesia License to provide conscious sedation and general anesthesia for adults and children. When not in the office, Dr. Laor spends time with her two kids, enjoys traveling to warm places, and cooking healthy and tasty meals.